Rogers Communications is one of the primary wireless carriers in Canada as well as being an internet, cable and phone company. Last summer, I looked at some of the changes that were shaping the telecommunication industry for the upcoming years and how they are essentially becoming utilities. Here is a snippet of their business segment from 2010 Q1. As you can see, Rogers operates in a wide variety of sectors but generates most of its revenue from wireless and Telus isn't far behind either. As you can see, most of the gain over the past year have been eradicated but I believe Rogers is position to recover. Rogers is theoretically a Canadian Dividend Aristocrat but they really have just started paying meaningful dividends 5 years ago. 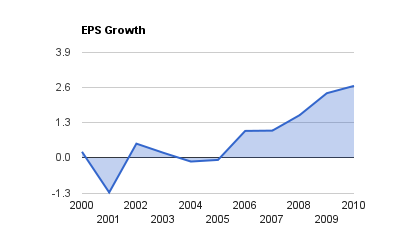 Since they have started paying a decent dividends, they have had nice growth. 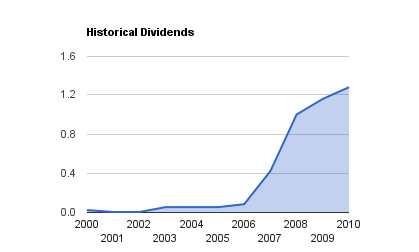 If you exclude the spikes from not paying much to paying decent dividends, the dividend growth has been above 10% per year. It definitely beats inflation. The lack of historical dividends can be concerning but at some point we can't let past data decide but let it inform us and look at the business and where it's going. Profits mostly come from wireless and Rogers is a big player across Canada. 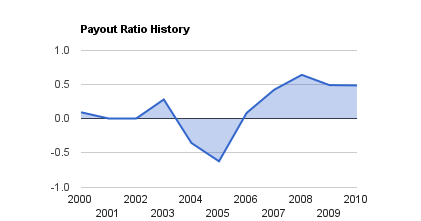 Earnings were troublesome for a little while and it has surely caused the payout ratio to be down. However, if we look at the past 5 years when growth and dividends started being meaningful, Rogers has had a healthy cash flow. Wireless data plans are really filling the coffers if we assume the growth started with the arrival of mainstream data plans. Consumers are hooked on their smart phones now, unless the company screws up, we should see the trend continue even amid heavy competition. Any negative EPS is not something we want to see since it means the company spent more than it earned. Again, looking at the past 5 years, the growth is steady and should be able to handle any necessary investments needed for their infrastructure. Most of their revenu is form wireless and the plans are locked in for 3 years so we could assume a 3 year rolling revenu growth. In the least, it's a 3 year revenue flat line due to the locked in fees for cancellation. Competition in the wireless business is fierce. Most of the players offer land line and with the deregulations that have happened in the past, you can usually have a land line with the company of your choice. As for cable, the increase in internet speed and infrastructure has allowed many players to offer cable over the internet such as BCE and Telus. They both are building fiber optic networks for their cable and internet networks. Shaw on the other hand is gearing up to compete in the wireless landscape. Anytime now we should see wireless options offered. The fierce competition business model is driving these companies to offer discount to customer for the number of services you have with them and are working on making all the services work well together. Can you see where we are going with the internet technology? Rogers has the lowest P/E of its peers, is price attractively and has a decent dividends. I am keeping the competitors to the Canadian carriers as AT&T is a much larger business south of the border. AT&T is worth looking at for anyone willing to invest in US dollars. If you have been reading my blog, you probably know by now that I like the utility companies. I own quite a number of them. Since the telecoms are turning into utilities, I will admit that I already own a few of the players and I have enjoyed some good profits so far. Rogers is interesting to me as it pays a good yield and has growth potential. It's a double win. Telecoms are utilities with growth! The best of both worlds. Readers: Does Rogers look attractive at this price? Full Disclosure: At the time of writing I am long BCE, Telus and AT&T.